It is so quiet in La Buissonade that all I hear is my breath flowing in and out. We are at our cottage rental in the Luberon and Remi has taken the dogs to go mushroom-hunting. I am doing yoga on the floor of the bedroom next to the heater - salutations to the sun despite the steady drizzle of rain falling on the other side of the plate glass door in front of me. Swan-dive forward, lift my heart, back into a high lunge, hover in plank and lower to the floor. When I peel up into cobra I am stunned to see the rain has morphed into a loose wet snow that gathers force as I continue. When I finish, my seated meditation is simply watching the flakes fall fast and furious. In the late afternoon, we pile into the Range Rover to go "see the snow" for on the upper hills it has stuck, stubborn. There is nothing to say as the car rolls along through villages illuminated by puffing smoke chimneys and not a soul to be seen. 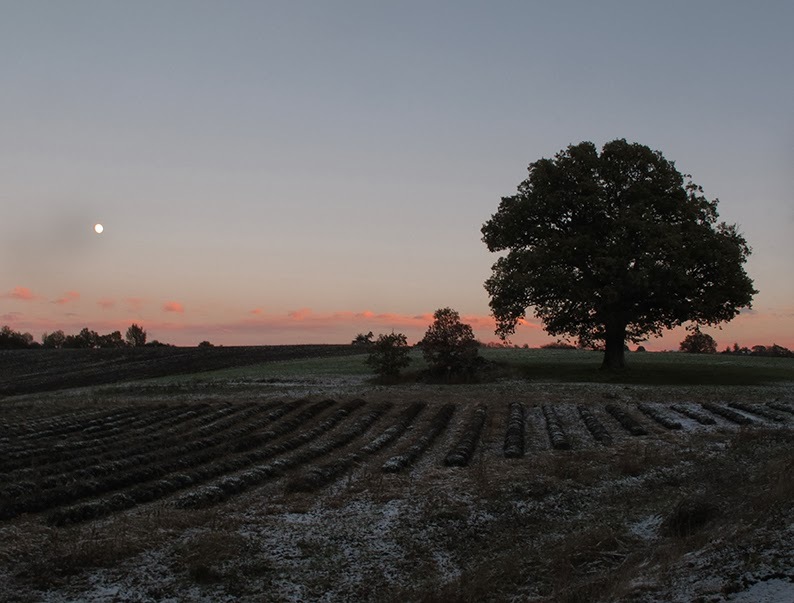 Nor as we pass the great oaks, the truffle trees sleeping. When we stop, it is for a reason. 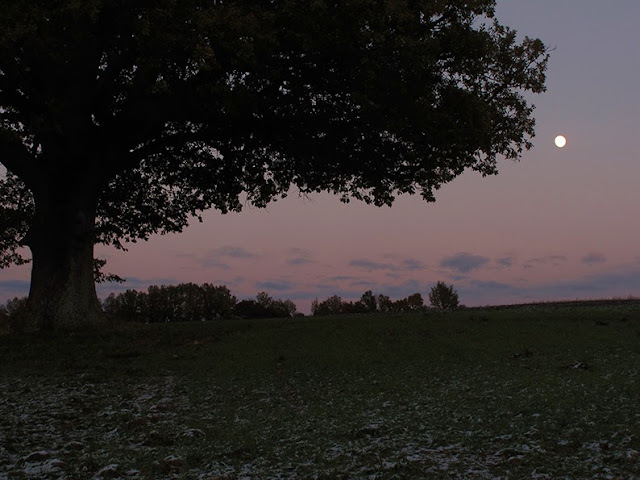 The moon has risen. 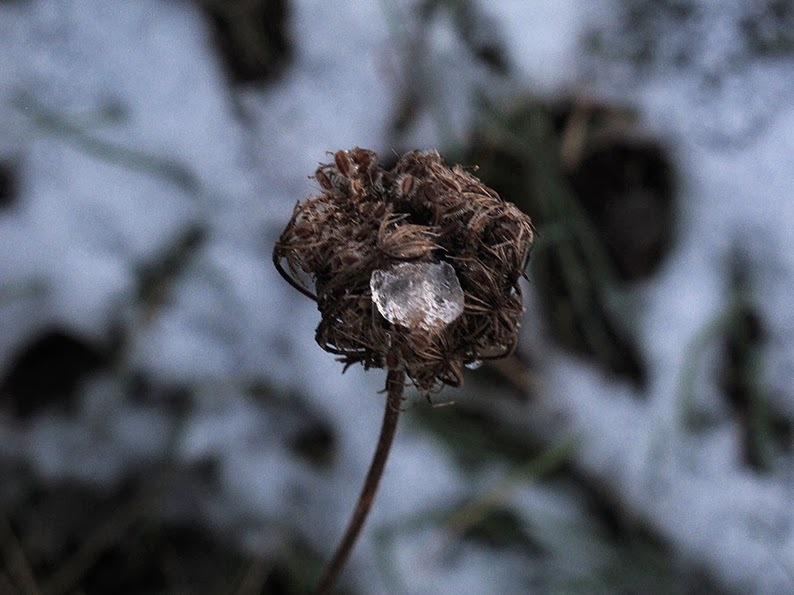 ...the flowers warmed from yesterday clutch the snow like diamonds, jewels to the heart. We stomp our feet and clap our hands to stay warm. Puffs of breath, that same in and out, escape like smoke through our grins. But it is beautiful. Finally, the bitter cold forces us to head back to the cottage but that moon is burned in my mind. The following morning I awake with an idea for a cocktail. Now, not that I have the habit of imbibing with breakfast - ok, only in New Orleans - but I have had a theme hovering in my head, knowing that in the beginning of December, I would need to create one for the holidays for the By Invitation Only Series. Nothing could be more inspiring than the snow on the lavender fields under that bone hollow moon. And so here it is, the Lavender Ice. It is so simple as to barely merit the title of cocktail. To prepare your glass, line the rim with honey then coat it by turning it upside down in a plate sprinkled with powdered sugar. There is your snow. Then prepare your liquid with 3/4 cold vodka to 1/4 lavender syrup (if you have trouble finding some, it could be easily made with simple syrup and lavender flowers heated, strained then cooled). I prefer my martinis stirred not shaken - sorry Mr. Bond - but do as you please. 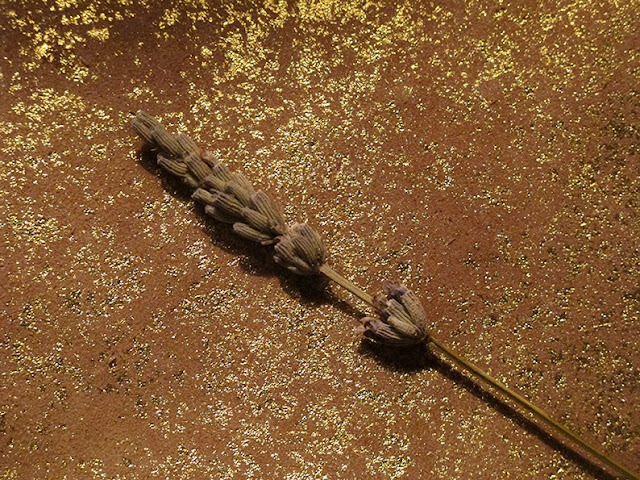 A stalk to lavender flower is the perfect garnish. The result is simply wonderful if I do say so myself. The lavender gives a fairly smoky finish so as to balance the sweetness of the honey, making it appropriate for both men and women, plus it is festive without being gimmicky, there are no bells and whistles here. None are needed. ...but tell me, what are you doing for New Year's Eve? To join what I imagine will be a truly festive party this month at By Invitation Only, please visit Splenderosa by clicking here. 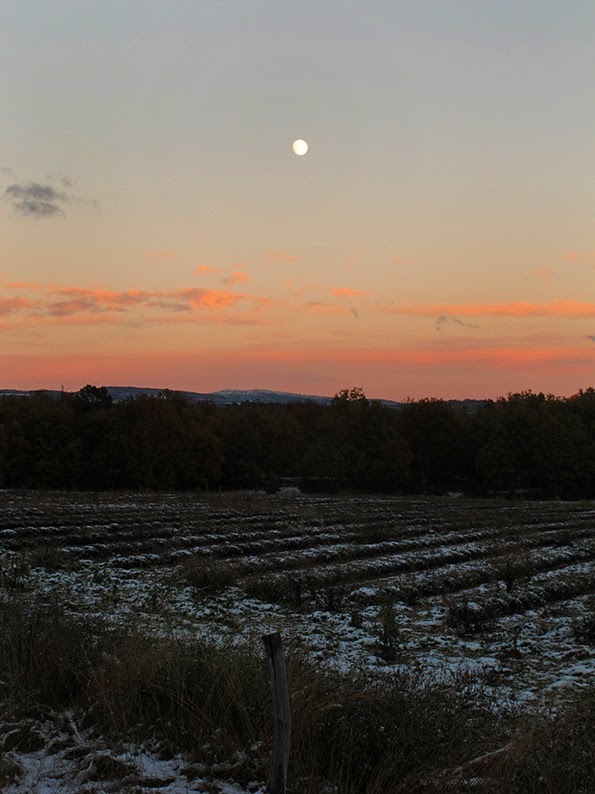 Snow covered fields, the rising moon, "..the flowers warmed from yesterday clutch the snow like diamonds, jewels to the heart." Ah, yes, you may yet get me in the mood. And you created a cocktail to enjoy while experiencing it all. Bravo! Thank you Coty. I am sending them right back to you on the other side of this blue marble. That's the same amount of snow, if not even a bit more, than what we have here almost 3000 km north from there. These sure are amazing times! Oh thank you Sister but zen master? Whoohoo that is a knee slapper! But I do appreciate the use of the word "lovingly" and will try to keep that in mind. Love you. One supports the idea of the sacred Christmas cocktail. Heather, you so consistently blow me away with your word paintings and photos! I was just about to post one of my 'how to cut the cost of travel tip' posts with cut and dried advice, but decided I treat myself to your post first. Now mine so pales in comparison, I may just skip it altogether. . .what a beautiful job you did on this one! I too hope that there is much merriness for you both this season. You are off to a heck of a start! How truly Heather this is. Recognizing every single element and seeing it's beauty. This is why we need you, my friend. You are like a jewel to our hearts. And, this little cocktail, how brilliant, how creative and how beautiful. Happy Holidays to you, Remi & the boys. That was such a gift. Thank you Marsha. And thank you so much for asking me to be a part of BIO too! Very, very, beautiful, and I confess to being a hard critic. Lavender feels so like summer to me - to see it caught in ice is something special. And the drink sounds delicious, I do not like sweet cocktails and am always hunting for the taste of smoke. I'd never realized until now how piquant lavender is, how close to smoke and tang. Thank you. No, thank you! The word that comes to mind when I think of you is "discerning" so this was a lovely compliment. And I detest fruity or sugary cocktails so agree (I made up a provençal martini that features an anchovy stuffed olive spiked on a rosemary branch that you might like). Actually, if you leave off the powdered sugar it will be less pretty but far less sweet too. But leave the honey, it is delicious! 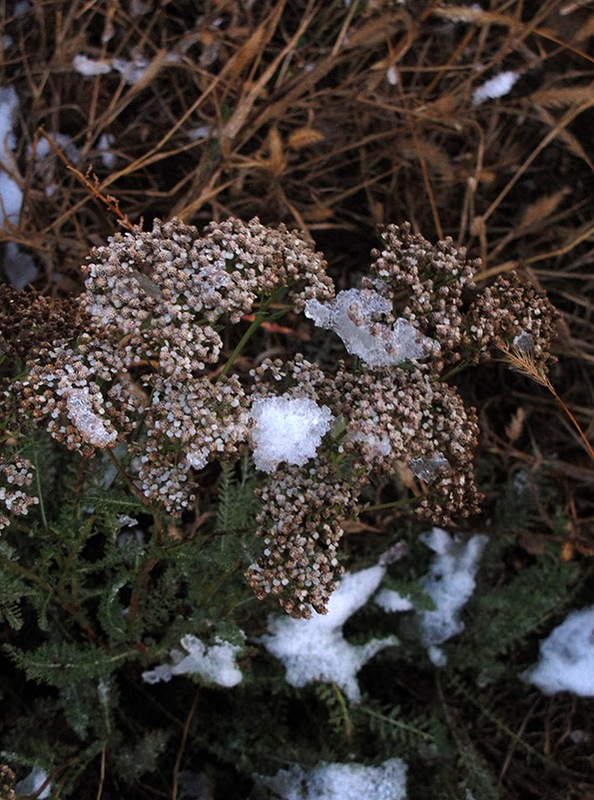 Watching the snowflakes fall after your meditation sounds magical, Heather...you write so poetically; an absolute joy! 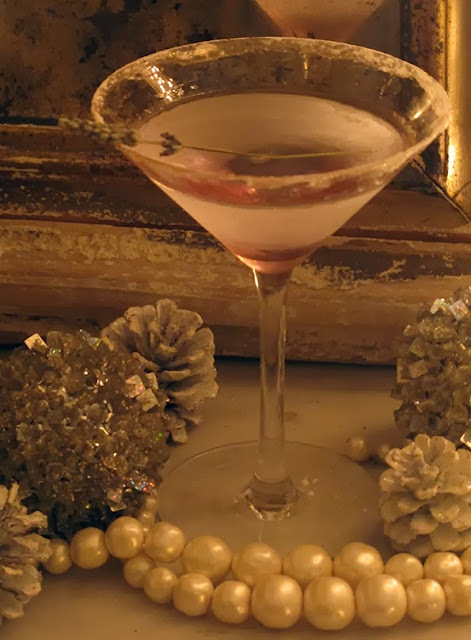 The Lavender Ice Cocktail...sophisticated simplicity...I'd love to join you in a glass! And to you, Catherine. By all means, come down to Provence. Something tells me we would have much to chat about over cocktails! I love your aesthetic, Catherine. Am never disappointed when I visit!! Your post with your wonderful images is warming up my heart! Stay warm Karin (and keep Mr. Oskar warm too) and have an excellent time in Germany!!! So true Jenny. Let's try and make this season a wonderful one! Amazing post. Lots of love to you. Thank you Cindy and to you! Happy Holidays!! Hi Heather...wow your pictures are enchanting!!! Love to see the real deal of your world at this very special time of the year! Sending love and wishes for load of splendid merry moments. That was very beautifully written Heather. And the photos? I am sighing all over them. It is almost too hard to contemplate such beauty. It was a really special moment, Loree. So different than your world in sunny Malte! We would have to bundle you up if you ever came for a visit!!! From a dusty mauve to a shimmering gold back to a dusty blueish-tone. A perfect blue (-mauve-golden) hour. One can hear the quiet. A wonderful experience. I will try that lavender cocktail in memory of those quiet lavender fields that become less frequent in France theatened by the change of climate, the hard work resuming them and the little profit they offer. Oh, Silke, you know I have to beg to differ! We have been vacationing in that area for the past few years now. We love it and go whenever we can. The first cabanon that we found (that I still love but we can no longer go with two dogs) is owned by a family that has cultivated lavender for generations. It was amazing to talk with them about the industry. The methods have changed for sure but it is still a very big business in that part of France. But it is worth mentioning that it is mainly lavandin and not wild lavender which is only grown above 800 meters of altitude. Oh yes Heather, you are absolutely right. I got my incomplete information from an article, I recently read but which unfortunarely I cannot find anymore. They also were differentiating between lavandin and what they called "original lavender" which needs dry soils. 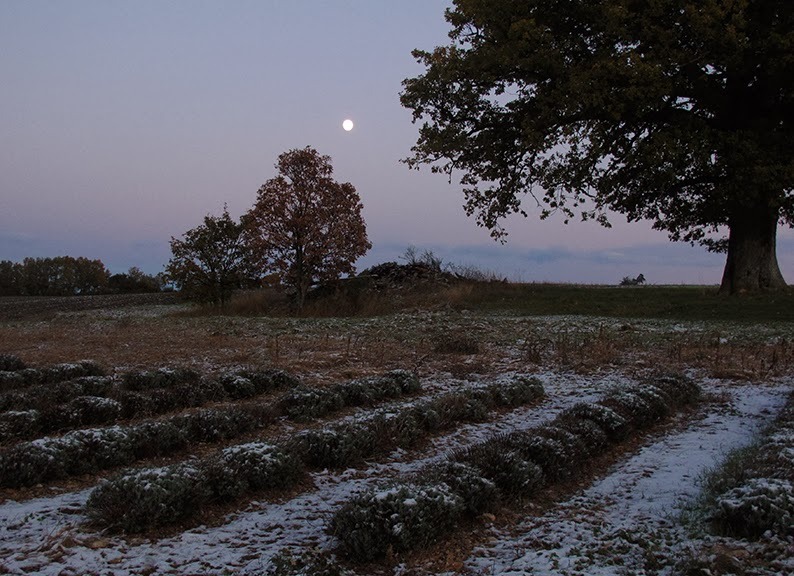 The article was about a familiy producing this type of lavender near Sault and they complained about more humid seasons. Mais tant mieux! It's alway good to learn something! A couple of years ago, I was reading the hardcover edition of a book by a well-known authority on Provence and realized that, in her making a distinction between Lavender and Lavandin, a typo had gone undetected. According to this rather expensive coffee-table book, "True Lavender" yielded a wonderfully calming/restorative essence ("often used by the perfume and pharmaceutical industries"....what a surprise...), whereas "Lavandin" was "toxic". I kid you not. This editor THOUGHT they might have meant "tonic" (although, even then, I wondered what the supposed difference between a "restorative" and a "tonic" might be). Oh well (and as Judith Ross would probably be the first to point), it's a good thing most folks aren't, after all, very adept at writing or editing......or we editors and writers would be out of a job, wouldn't we?. I think that yours is my favourite post for our December BIO ….. it is nature, it is winter, it is December and, most of all not at all indulgent. Not a great fan of vodka but think this would be equally fabulous with gin??? My one tiny lavender bush is flowering like a lunatic at the moment, so even though it is actually breakfast time right here, right now, I, like you were, am happily dreaming of cocktails like this….oh dear!!!! Look what kinds of trouble we are creating!?! ;) And you know what dear V? I bet that it would be fantastic with gin. Probably better actually! Well, this posting is just.....simply beautiful. I can't think of a single thing to say beyond that, Thank you so much. Wow. Really? That is a huge compliment coming from you, David. Thank you for it. I can't believe you've left him speechless, Heather! Yowza! No yoga for me in Saigon. Noooo thank you! It would be the definition of "hot yoga"--except that it is humid too!!! And even in my chilly room this morning, that hover was more like a "pause." hehehe And more often than not, it is "knees, chest then chin"!! I have Olive Oyl arms, what can I say? So happy to see you here, as always. Bisous. Perfection! Love the cocktail. I am making pot pourri; have lavender essence permeating the air; it's a hot afternoon, a cold icy drink would be lovely. I bet some lavender syrup in some sparkling water would be lovely too. Sending cooling thoughts your way! It's wonderful to follow your narrative flows with your sequential yoga poses starting with sun salutation and ending with the risen almost full moon. 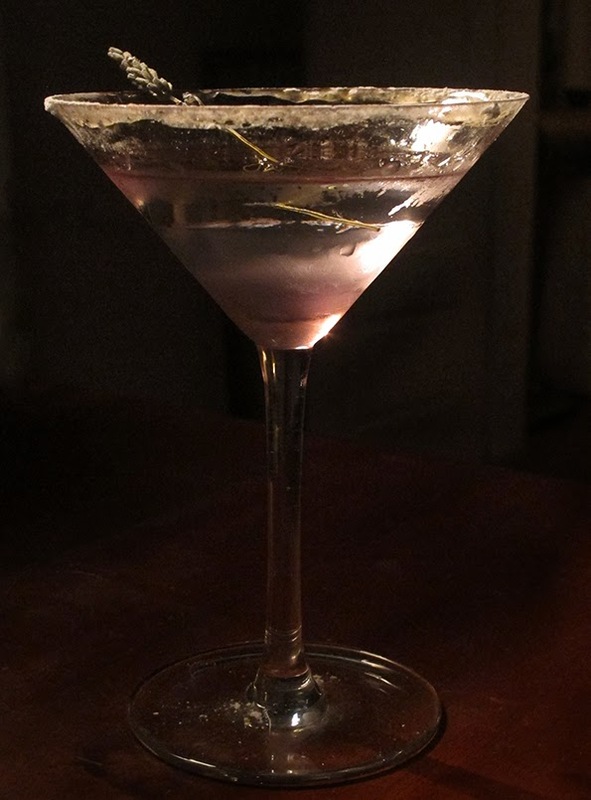 The lavender ice as garnish for your martini is new and a novelty. "Of love, of giving, of being together" are gifts from and for the heart. Mrs. Abstract and I have not planned any New Year's celebration yet. It's nice to hear "Ella". By the way, we have a scented stuffed lavender dog on our bed. Now THAT is the kind of dog that I would allow on my bed. A certain Mr. Kipling believes that he has a right to lay there as well. He is sadly mistaken! I imagine there are glorious options for NYE in your neck of the woods. I vote to spoil Mrs Abstract! And thank you for the kind words, I hadn't even realized that it worked out like that from sun to moon. How do you like them apples? The moment I looked to the frozen already dried out lavender I symbolized that beauty is not forever but will reborn again when time allow it. Didn't know that you are a Yoga girl too. It help's so much to get over a difficult part in life and to find yourself again. Don't you think so?... it's working for me. And the cocktails....I prefer Martini dry...also stirred (perhaps otherwise I need a tumbler, smile). Will spend my NYEve as always in the last years together with my beloved husband in silcene and contemplation and NY is the perfect day to do so. I am not either alas. My party days are pretty much over especially as I have become increasingly shy in groups with age, certainly since moving to France. I don't know why but it is true. But I am glad that I "tripped the light fantastic" when I was in my 20s in NYC. I have nothing to regret--it was amazing! And I want to spend a special thank you to you. I read your comment this morning (but had a pupper with his head on the keyboard so it was hard to type) and thought about it when I took the dogs for their walk. You see, my yoga practice has really been not as solid at all as it usually is. I thought about what you said and I know you are right. And the fact that I am NOT doing as much yoga means something too. So I came back and did a really great opening sequence. I am going to try and get back on track. Dear Heather this post is so moving, the images are mesmerizing and the Lavender cocktail...heavenly! Thank you Karena. Sending you my Warmest Wishes for a lovely Holiday Season! It is magical up there at this time of year, Ann. When Lucy gets older...you will have to take her to the lavender fields! Such a beautiful inspiration for a cocktail! Elizabeth, I still make some of your cocktail recipes, so I am happy to give back at least one! I hereby declare, Lavender Ice as the official cocktail of The LPV. HOW D I V I N E is that!THATS MY GIRL…………………..cant wait to try it!!!! All the imagery-post and prose, so divine. LOVE waking up to thoughts of a cocktail! Was it a Monday?! How did I miss this post?! This cocktail looks pretty much amazing. "Not gimmicky" at all. Ha! I have been wanting to do a holiday cocktail but all of the ones I have found have peppermint in it which to me, mint and alcohol just reminds me of mouthwash, or tons of cream and sugar. The Lavender Ice may be what I have been looking for. NYE, we're going to a friend's house for a small cocktail party. We usually host, but this year we decided to accept an invitation. I can't believe it's so soon!